← It Doesn’t Even Matter. Once a year my church completely shuts down for a whole weekend. No services, no meetings, no bible studies. 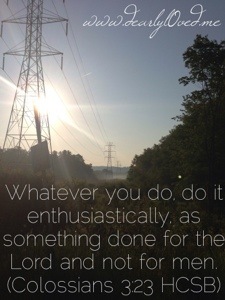 Everyone is encouraged to go out into the community and serve. More than 800 volunteers serve in areas ranging from home renovations to yard work, giveaways to random acts of kindness. I was blessed to be able to serve on the car wash team this year. We spent all day washing cars completely free- no donations accepted. Just free. While I believe we live in a society of entitlement and all too often greed, I have found that people have a hard time truly accepting anything for free. Why? Because that requires humility– admitting that you have a need. At one point in the day, a very challenging old woman came by. She wanted her car washed, but on her terms. She began bossing around some of the younger volunteers and making demands. She also (repeatedly) expressed her disappointment that we were not vacuuming or buffing the windows inside the car. I am not the most patient person. Really, I wish I was, but it just isn’t my gifting. I so badly wanted to say, “Look, lady, we are doing this for free; take what you get.” But I didn’t. Instead, I stayed quiet and continued to serve. I heard the still, small, patient voice inside. As I was detailing the inside of my new friend’s car, she began to share her story. She told me that she was a recent widow. She shared that she was a breast cancer survivor, but was recently diagnosed with lung cancer. She shared some of her financial struggles. It became clear that this was a woman who was in need of some love, grace, and patience. When we finished her car, she gave me a big hug and expressed her gratitude. She said she wouldn’t have been able to afford a car wash on her own or do it herself. Seeing her gratitude was the biggest blessing I could have received! Reflecting on her testimony and the events of the day, I am reminded of Christ’s gracious sacrifice for us. The same way my challenging friend wanted a free car wash done her way, we often want to accept the free gift of salvation on our own terms. “Jesus, I will accept your grace, but I still want to do this.” “Jesus, I’ll let you save me, but I’m not sure I want to do such-and-such.” We need to remember that grace is free- you don’t get to have it your way. We struggle with salvation because we lack humility. With salvation, just like at the car wash, all you need to do is accept the free gift, no strings attached and no work required. I thank you for being able to serve today. Thank you for blessing me with enough, so I can give to others. I pray for my new friend. May she find peace and healing in You. Help me to remover that You are offering grace as a free gift. No work required. Give me a humble heart that is willing to accept that grace on Your terms. In Your Almighty name, Amen.